NORFOLK – The Virginia Department of Transportation (VDOT) will close the temporary E-ZPass Customer Service Center at 124 East Little Creek Road, Norfolk, VA 23505 #118 (next to the Book Exchange in the Wards Corner area) at 5 p.m. Sunday, January 28, 2018. . . The Virginia Department of Transportation (VDOT) has opened an additional, temporary E-ZPass customer service center to assist travelers ahead of the 64 Express Lanes launch set for 5 a.m. Wednesday, January 10. . .
NORFOLK - The Virginia Department of Transportation (VDOT) today announced a mobile app for 64 Express Lanes will be available for use beginning with the opening of the new express lanes in Norfolk. NORFOLK – With just a week until the start of tolling on the I-64 Express Lanes in Norfolk, VDOT continues field testing of the tolling system on the High Occupancy Vehicle (HOV 2+) lanes, and testing that will occur on Wednesday, January 3, 2018 will show an unofficial toll rate. Motorists should be advised the rate displayed is only for testing purposes. NORFOLK – The Virginia Department of Transportation (VDOT) will begin tolling the 64 Express Lanes the morning of Wednesday, January 10, 2018. During operating hours (5 a.m.-9 a.m. westbound and 2 p.m.-6 p.m. eastbound Monday through Friday), motorists will need an E-ZPass or E-ZPass Flex to access the 8.4-mile stretch of Reversible Roadway between the I-264 Interchange and I-564. Outside of operating hours, the lanes will remain free and open to all motorists. The Virginia Department of Transportation (VDOT) wants the public to know beginning Tuesday, November 14 through Friday, November 17 current High Occupancy Vehicle 2+ (HOV-2+) restrictions will be temporarily lifted only on the I-64 Reversible Roadway in Norfolk. During this time, motorists entering the Reversible Roadway can also expect to see test messages displayed on signs, ahead of the planned 64 Express Lanes launch in December. Field testing of electronic tolling equipment for the 64 Express Lanes is currently underway to ensure the system is fully functional when tolling begins early next month; however, until the official launch, motorists will not be tolled for using the system. As testing continues, travelers can expect to see test messages displayed on signs before entering the Reversible Roadway. Motorists in the Reversible Roadway may also see flashes from strobe lights as they pass the overhead gantries. Drivers in the general purpose lanes may witness some flashing as well. VDOT is converting 8.4 miles of HOV-2+ lanes to Express Lanes between the I-64/I-264 Interchange and I-564. When the lanes launch, variable tolling of the 64 Express Lanes will be in effect from 5 a.m. to 9 a.m. westbound and 2 p.m. to 6 p.m. eastbound Monday through Friday. Drivers wishing to enter the system during operating hours must have a registered E-ZPass or E-ZPass Flex device. Outside the tolling hours, the 64 Express Lanes will remain free and open to all motorists with no E-ZPass or HOV requirements in effect. Join the Virginia Department of Transportation for a town hall meeting to provide the public with details about the conversion of I-64 HOV+2 lanes in Norfolk to Express Lanes beginning in December. The town hall meeting will take place Wednesday, November 8 from 5 p.m.-7 p.m. in the auditorium of Princess Anne High School in Virginia Beach. The town hall will be led by Virginia’s Deputy Secretary of Transportation, Grindly Johnson. The public is invited to see a presentation about the new Express Lanes and learn more about E-ZPass and E-ZPass Flex transponders which will be required to use the lanes during operating hours. WHEN: Wednesday, November 8, 2017- 5 p.m.-7 p.m.
WHO: Presentation led by Virginia’s Deputy Secretary of Transportation, Grindly Johnson. 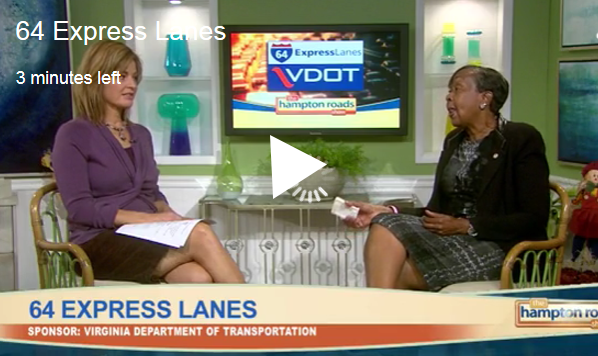 Deputy Secretary of Transportation Grindly Johnson (right) explains the many benefits of the 64 Express Lanes coming to Hampton Roads this December. VDOT is dedicated to ensuring motorists are prepared for the launch of the 64 Express Lanes in December. The project team, including Deputy Secretary of Transportation Grindly Johnson, has been presenting to the military, local government, business and civic organizations. Outreach efforts range from televised appearances to billboards to tabling events. If you would like to plan a presentation for your organization, e-mail us with "Express Lanes Presentation" in the subject line. You can also follow us on Twitter @VaDOTHR for daily updates on the 64 Express Lanes. 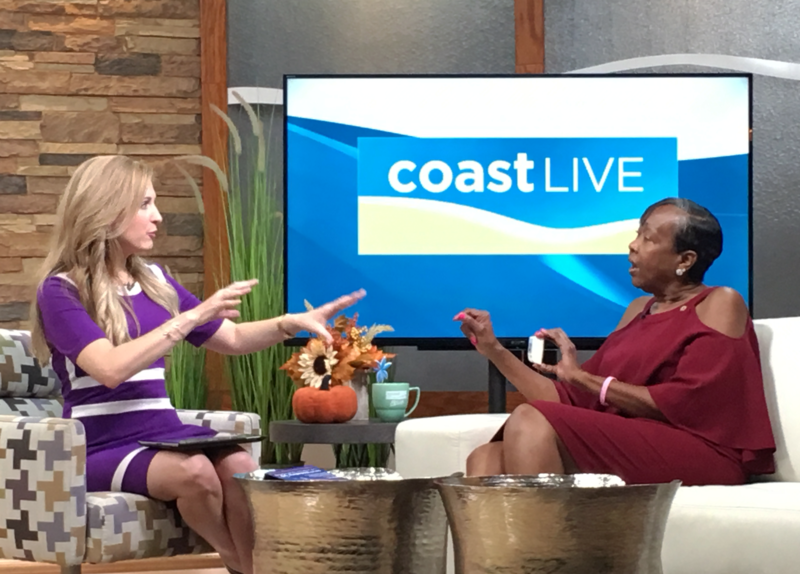 Deputy Secretary of Transportation Grindly Johnson (right) discusses the 64 Express Lanes with Cheryl Nelson (left) of WTKR's "Coast Live." 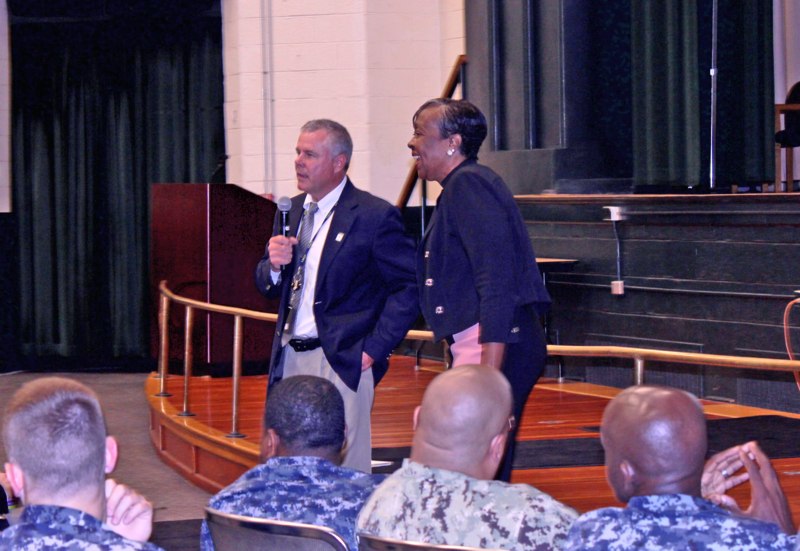 Deputy Secretary of Transportation Grindly Johnson (right) presents on the 64 Express Lanes to a gathering of U.S. Navy servicemembers along with VDOT Tolling Administrator David Caudill (left) at Naval Station Norfolk. Segment 1 (approved) – I-64 from I-264 to I-564 in Norfolk. These reversible Express Lanes are expected to be operational in December 2017. Segment 2 (proposed) – I-64 from I-664/I-264 (Bowers Hill) to I-464 in Chesapeake, as well as conversion of the existing HOV lanes from I-464 to I-264 in Norfolk. Segment 4 (potential) – I-64 from I-664 in Hampton to Jefferson Avenue in Newport News. This HOV segment will be evaluated for conversion to Express Lanes in the future. You can read the entire presentation to the HRTPO here. CHESAPEAKE- Secretary of Transportation Aubrey Layne today briefed members of the Hampton Roads Transportation Planning Organization (HRTPO), Hampton Roads Accountability Commission (HRTAC), local officials, citizens and the media on the Virginia Department of Transportation’s (VDOT) plans to reduce congestion, improve reliability and provide motorists with travel choices. VDOT will convert eight miles of Interstate 64 High Occupancy Vehicle (HOV-2) lanes to Express Lanes, also known as High Occupancy Toll Lanes. ARLINGTON - The Commonwealth Transportation Board (CTB) today voted to authorize VDOT to convert eight miles of Interstate 64 High Occupancy Vehicle (HOV-2) reversible lanes to High Occupancy Toll (HOT) or Express Lanes from the Interstate 264/64 Interchange to Interstate 564 in Fall 2017.